Margarida Faria [Virtual Hug], Maurício Martins [electronics]. Hug@ree is an interactive installation in which participants hug a real tree, bonding urban dwellers with nature. The experience enhances affection through the physical contact with nature and on how individual action can collectively become so relevant. The tree is instrumented to record and transmit a video loop of each hug to a real-time interactive video collage, which exists online and as a touchscreen in the exhibition space. People can interact by positioning their own video loop on the tree branches. Multiple Hug@ree instances around the world collect tree hugs that are uploaded to an online platform, composing a global shared embrace of nature. 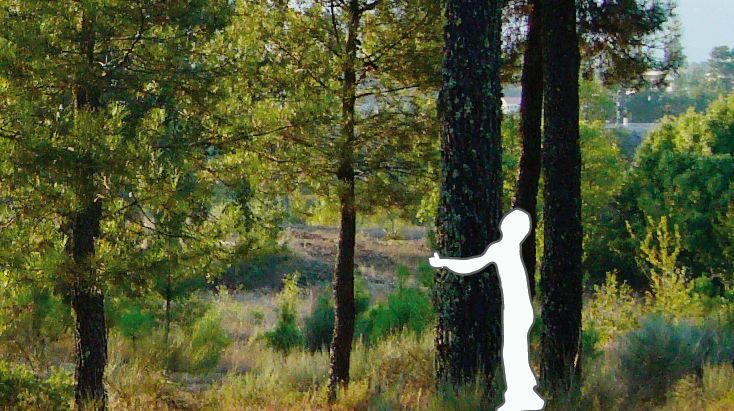 Hug@ree was designed to be deployed all over the world in such a way that all instances collect tree hugs that become part of the same virtual world. The installation was exhibited at the Pop Up City exhibition in Lisbon, a bonsai “portable” version premiered at AZ Labs creativity exhibition in Porto followed by TEI'11 Art Explorations, a demo at the Artropocode meeting in Santiago de Compostela, an installation at the UCLA Summer Institute program Sci|Art in Los Angeles, and at the small village Maçal do Chão premiering the registration feature and usability tests. Hug@ree was also presented through a demonstration that was screened at IEEE WHC in Daejeon, where the ARTiVIS DiY forest surveillance kit with a Raspberry Pi was first used. The most recent nodes were implemented at Noosa with an indoor palmtree during Balance-Unbalance, at Sydney University during ISEA, and during European Researchers's Night at Pavilhão do Conhecimento in Lisbon. This ARTiVIS installation is always open to set up new Hug@ree nodes. The Hug@ree experience encompasses two distinct moments. In an outdoor space, a tree – instrumented with conductive wires ergonomically distributed around its trunk forming a capacitive sensor – detects participant's hugs. A microcontroler attached to the wires triggers a hug when most of the sensors detect the participants' contact, sending a signal through a wireless radio transmitter to the indoor installation space. 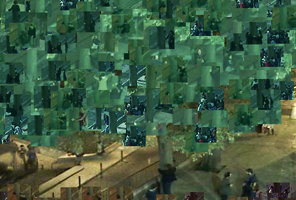 While a camera continually records the tree outside, custom software captures and keeps the last few seconds of video. When a hug trigger reaches the wireless radio receiver, the software saves the video and sends it to an interactive tangible projection. 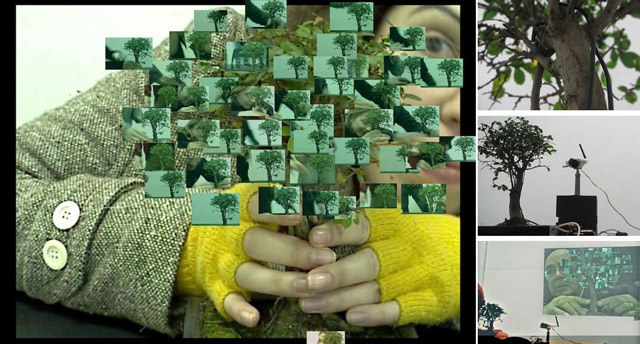 Then, participants place the video loop of their own hug on the screen tree, becoming leaves of a collective experience in a videoloop hugs gallery. A portable version of Hug@ree was born from the need to present Hug@ree in a limited space and when there's no trees around, such as certain parts of cities or conference demos. It does keep the *real tree* factor, only in a different scale and body contact. Multiple Hug@ree instances around the world collect tree hugs that are uploaded to an online platform, composing a global shared embrace of nature. 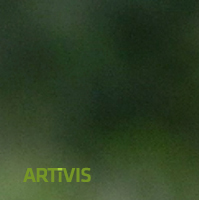 The gallery of hugging trees serves to register users in the community to motivate active participation, and invite other participants to hug the tree, naturally expanding the ARTiVIS users database. Trees have an enormous power, but they are also vulnerable to human action. When hugged in public, they can become a powerful symbol for environmental activism, a reminder about our responsibility towards nature – in the present and for the future. Hug@ree is part of ARTiVIS » Arts, Real-Time Video and Interactivity for Sustainability, an exploratory research at the intersection of Art, Science and Technology. The project proposes to investigate innovative concepts and design methods regarding the use of real-time video as raw material for artistic exploration on environmental causes. Can art foster awareness and respect for nature? Regarding the impact and the potential of art and technology on society and the environment, the idea is to inspire change in individual lifestyle. From our interviews of local populations on forest fire issues, observation of participants and tests during the installation experiences, and their feedback, we infer that these interactions contribute to a feeling of belonging, providing contact with nature and strengthening the relationship with the forest, and also leading to local communities awareness. We believe that it will also contribute for further empowerment – ultimately, for a more sustainable environment.